Almost exactly seven years ago, Hilary Sholin joined the Honolulu Museum of Art team as the development associate. Since then, she’s grown into the larger role of development officer overseeing general memberships and annual fund programs. To say Sholin is a staple of the development team would be an understatement. 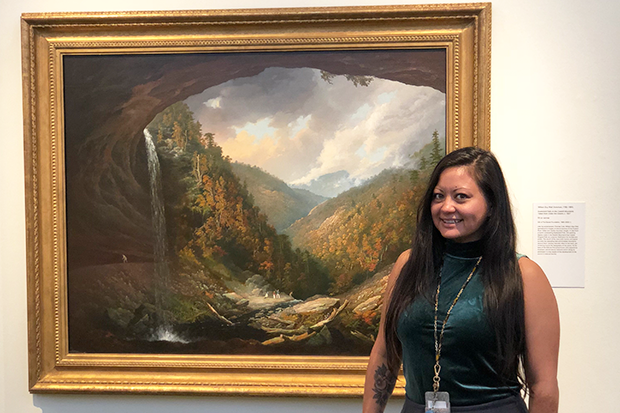 Sholin heads straight upstairs to the 18th to 20th-century American Art Gallery to locate her favorite painting, Kaaterskill Falls on the Catskill Mountains, Taken from Under the Cavern. Created by William Guy Wall in about 1827, the oil painting depicts a nature scene so awe-inspiring, we think Kant would call it sublime. I graduated from UH Manoa in the early seventies by going to school on the GI Bill. For an elective one semester, I chose “Art Appreciation”, 200 level. It was held at the old Varsity Theater on University and the class was two hundred plus students mostly nineteen or twenty. So I and a few others were older. The young instructor, taught this class within the framework of Dada Art of the 1920s. Dada was the background for the class; that is, art as satirical and nonsensical in nature… as a reaction to the horrors and folly of World War 1. As I had recently returned from Vietnam combat, I could readily relate to satire of those who would start wars using other people’s children. He began “Art Appreciation” by firing up his Harley, driving it into the auditorium, down the incline between us students, and parking it at the bottom of the movie stage. He bounded up the stairs to the stage, spread his arms wide, and welcomed us to his art class. Wow! he got our attention, and it was a very fun class. The biggest gift was the HOMA assignment where I “discovered “Kaaterskill Falls…” Our assignment was to visit your (our) museum alone, explore, and possibly discover some art that moved us- then write about it. I was becoming a little anxious because after over an hour, nothing had happened for me yet. Then I saw it, and stopped stock still, staring at “Kaatersskill Falls on the Catskill Mountains, Taken from Within the Cavern” by William Guy Wall. At first I was consumed by the beauty and the immensity of the painting…. then the colors, and the beautiful day. It took several minutes until I saw the small figures at the entrance to the cave also admiring nature on such a grand scale. I followed their upturned faces and once again my mind’s eye expanded to absorb the whole of this magnificent painting. At this time in my young life, Mr. Wall’s work gave me some peace… I was able to move outside of my memories and into nature, and feel some hope for the future. I hike still and I occasionally look up this painting, and I’ve nurtured an interest in The Hudson River School of Art. Once again, Hilary Shobin, thank you. Kate and I are glad to be members and happy to live again in Hawaii.